When ordered on the Webshop the VA700 includes UKAS calibration, normally an extra £75, free of charge! 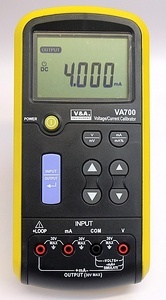 The VA700 is a process calibrator with volt and mA (milli amp) measurement and simulation. It is designed for calibrating process instruments, sensors and transmitters. Each unit comes with its own UKAS calibration certificate, giving you full confidence when you use it for calibrating or checking other equipment. Supplied with test leads, connectors and soft carry case. Optional external power supply also available.